If you have several business-critical programs on the go, think about how they are progressing. Would they be run better if brought together and run within a portfolio? Step 1. A clear vision from the Leadership team is a must! To succeed, the Leadership Team must make sure the organisation is aligned behind the delivery of the business-critical objectives. Alignment is binary. Your team is aligned – or it’s not. The entire executive team must share a common view of the business strategy and share a collective accountability for seeing its business-critical programs through to completion. They frequently say they are – but behind the rhetoric, the reality can be poles apart. Vision, clarity and focus are prerequisites to success. With a clear vision comes a clearly defined program baseline - describing the purpose of a program, its benefits, the work - and how that work will be delivered. A proper program baseline process will increase the confidence in and provide immense credibility for any program. In truth, a program baseline is actually three interconnected baselines. The Cost – a baseline for the budget, including resources - people, equipment and services - required to complete the program. Without proper baselines across all of the programs in your portfolio, there can be no performance measurement, no analysis of program benefits and limited confidence that it can be delivered as required. Question whether your organisation is structured in the right way to deliver business-critical programs. Often, the executive team believes that all that is needed to run a business-critical program is a Program Management Office. Yet, a PMO is only effective when it is suitably structured for the types of programs that it manages. A properly managed Program Portfolio requires a ‘Directing’ PMO, with a core team of key specialists. The Directing PMO goes well beyond co-ordination - it actually takes execution responsibility, controlling all the levers required for successful delivery. Typically, reporting to a C-Level Portfolio Director, they provide critical program management skills and experience; owns the core resources, and controls the budgets to direct and manage a program portfolio. This guarantees consistency and control across the portfolio – and gives programs the best possible chance of success. Invest time to properly assign correctly skilled and experienced people to the right roles, rather than compromising with a ‘fit it around’ day-to-day activity approach. Many companies struggle to identify the unique capabilities they need to execute business-critical programs. Often the right people – with the right skills – aren’t made available when they are needed, leading to the business sleepwalking into “time-slicing” – using ‘parts of lots of people’ from different functions to work on a program. Demand for program resource should be a by-product of the detailed program planning and baseline process. Step 5. Communication is key! Clarity and precision in your messages are vital to the success of your business-critical programs. Good consistent communication within, and across, all programs in your portfolio makes sure the Leadership’s vision remains understood; that people are clear on their contribution; and their focus is kept alive. The first step in making a program strategy concrete is to explain the facts, without spin. The foundation for good program execution is being clear and explicit on what is required – and what has been achieved. Plain talk is never easy to do but if you want to invigorate people, encourage them to make sacrifices and be innovative, you have to communicate expertly. The right governance structure allows management to refine the definition of success while maintaining alignment with its central business strategy. Program governance refers specifically to program development and execution. It defines the objectives of the program, as well as the operating processes and decision-making systems that will be used throughout. Its goal is simple: to make sure everything works smoothly; that the team operates efficiently and, above all, the final outcome meets the requirements rooted in the baseline. Setting up the correct reporting procedures, identifying the most suitable Program Sponsor and Steering Committee, helps to make sure the right levels of accountability will be in the right parts of the business, at the right time. Program governance will also identify program inter-dependencies – programs that rely on one another to progress. With the right governance systems in place, the ‘mismanagement’ of inter-dependencies between individual programs, becomes less likely, and “provided-that-someone-else-does-this-by-then” statements are thing of the past. The business-critical programs in your portfolio should be run by a Full-Time Portfolio Director – with matching political clout. With the portfolio established and the governance structure set up, it now needs to be run and maintained by an experienced “heavyweight” Portfolio Director – someone who has successfully managed business-critical programs before. This Portfolio Director is an Executive – not a ‘coordinator’ – and will spend a great deal of time with the relevant C-level executives, - providing clear updates on progress and identifying ‘road blocks’ that inevitably will need to be removed - with their help. The relationship between Portfolio Director and the Company’s Executives must be open and honest; delivered with integrity - creating a high level of trust. Simply put, if you want your business-critical programs to perform well, you must match the Portfolio Director to the demands of the programs within it. Good portfolio management will ensure delivery of the collective benefits of a group of business-critical programs. Executive team alignment, the appointment of a heavyweight Portfolio Director and successful program base-lining are the foundations of your portfolio. In turn, they allow the PMO, resources and skills necessary for the delivery of your business-critical programs to be earmarked. In our experience, good Program Portfolio Management can accelerate the execution of the business-critical program by up to 70%, improve resource efficiency up to 40% and ensure the highest level of team engagement. Following these seven steps will go a long way to underpinning your business-critical objectives to secure the most attractive financial and strategic opportunities. The power of the seven steps is in their combined influence. Just doing one or two will not deliver what you want or expect. 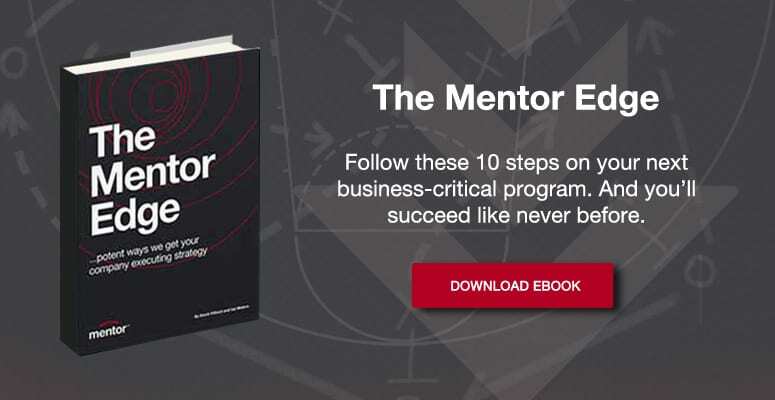 Learn what Mentor can do for you and your Program Portfolio. Why work with third parties? Program execution: an inconvenient truth!